The Village Voice is questioning the merits of some top designers suing Forever 21 for "ripping off" their style. Over 20 designers in all are calling the store out for their fashion faux-pas, and they're led by Diane Von Furstenberg, president of the Council of Fashion Designers of America, who has brought the case to Washington "attempting to get federal legislation passed that would make clothes-copying clothes a criminal offence." There's no question where Forever 21 got the inspiration for their giant spot chiffon top (left). 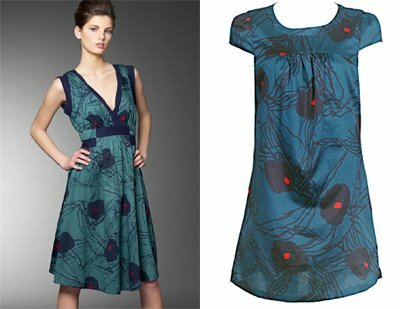 It quite obviously draws inspiration from one of the stand-out prints from the Spring / Summer 2006 Diane Von Furstenberg collection, and in particular the 'Elisabetta' top. The designer find is now difficult to find (sold out at both Nordstrom and Net-a-Porter) but the bargain alternative can be picked up now for less than $20. It'd be rude not to buy it, surely. This isn't the first time she's taken issue with the store, and now she claims they have knocked off her famous wrap dress and more than one of her prints, one of which the Voice adds "actually looks a lot like an old Marimekko design." I heart Marimekko! Finlands pride & joy! 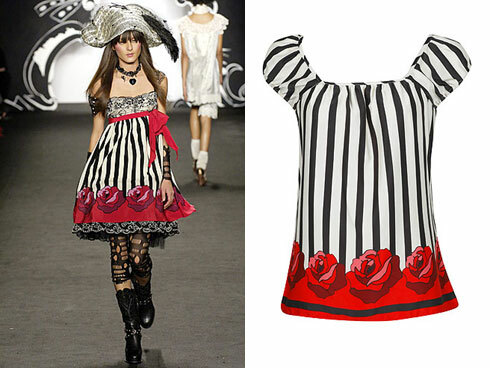 Anna Sui, who based an entire career on resuscitating, revamping, and rethinking the vintage fashions of the 1960's and 70's, the decades when she was young, is also livid about Forever 21 ripping off her designs, and she's suing as well. So incensed is she that for her spring 2008 show (a collection described in part as "pure Barbara Hulanicki," citing the designer of the iconic 1970's label Biba), Sui stuffed each gift bag with a T-shirt depicting the owners of Forever 21 on a Wild West–style poster with the legends "Forever Wanted" and "Thou Shalt Not Steal." Even Anthropologie (who surely rips off styles all the time) is in on the lawsuit! Everyone involved should be taking a good look at the history of fashion, however. Pictured are a Forever 21 dress and a Diane Von Furstenberg dress, guess which is which! Inspiration and influences are admittedly incorporated into designers own lines all the time. The Voice also points out that "lots of designers spend Sundays at the flea market. (They are, in fact, notorious for sweeping through the Manhattan Vintage Clothing Show.)" Head there yourself later this month before the designers snag the rags, put their name on them and mark up the price! Umm, what about H&M? If Forever 21 is catching heat, H&M shouldn't be far behind. The chain, Forever 21 (originally known as Fashion 21) was founded in LA back in 1984 by a Korean couple, Don Chang and his wife. While the first store was only 900 feet, Fashion 21 eventually became so successful that Chang and his wife were able to open a new store every six months! In 1989, the first Forever 21 store was placed in a mall and increased from its previous size to 5,000 square feet. Today, the company operates about 400 mainly mall-based stores in the U.S. and Canada under the names Forever 21, Forever XXI, and For Love 21. Forever XXI stores are larger than classic Forever 21 shops and offer men's and women's fashions as well as lingerie, footwear, cosmetics and other stuff. Heritage 1981 and Gadzooks are also a part of the Forever 21 chain. Like Wal-Mart, Forever 21 has eschewed the traditional $x.99 pricing and instead set their prices in the form $x.80. Clothing may be purchased on their website in addition to the stores. Forever 21's trademark yellow shopping bags have the words "John 3:16" printed hidden on the bottom, a reflection of the owners' faith. Maybe God will step in and stop the lawsuits then. Yay! Ain't it DISGUSTING that the one on the left probably costs $50 and the one on the right over $500!??? Do we want patents on clothing design now? Bring it on. None of the designers protesting would stand a chance...They copy (cut and paste) too. Let's get the entire industry filing law suits and be done with it! Then finally, there will be some real value prices attached to all this chite.